Intrinsically safe, Type nL, general purpose versions. A collection of smart loop-powered 4-20mA hazardous area indicating temperature transmitters for use in flammable (classified) locations and general purpose areas. Offering a choice of field and panel mounting models with a large 20mm ±99999 digital readout and 31-segment bar graph. Can be configured to measure temperature, voltage, or resistance. 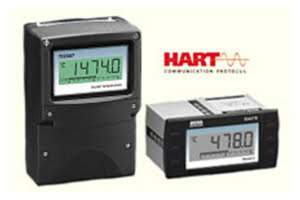 HART® communication with transmitter and sensor diagnostics provides alternative digital data for the process measurement, plus remote configuration. All instrument functions and calibration, including the type of input, can also be performed via the external push buttons (optional on field-mounting models). Options include dual alarms and display backlighting to solve a wide range of industrial measurement problems. Instruments are supplied calibrated to customer requirement free of charge and can be labeled to show units of measurement, tag number and application.